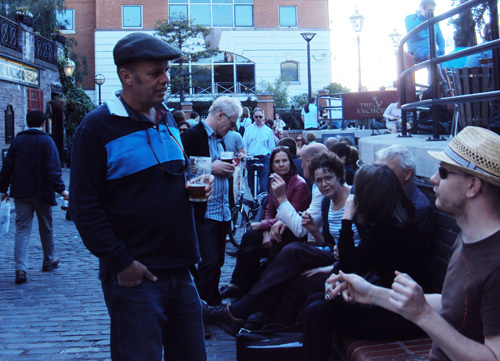 A guest post by LH Member Martin Thompson. Sir Giles Gilbert Scott was an English architect known for his work on such structures as Liverpool Cathedral, Waterloo Bridge, Bankside Power Station, Battersea Power Station and also for the design of the iconic red telephone box. He came from a family of architects. His father was an architect, himself the son of Sir George Gilbert Scott, known for designing the Albert Memorial and the Midland Grand Hotel at St Pancras Station. Scott was born at 26 Church Row, Hampstead. He was one of the six children and third son of George Gilbert Scott Jr and his wife, Ellen. He attended Beaumont College preparatory school and in January 1899 he became an articled pupil in the office of Temple Moore, who had studied with Scott’s father. In later years Scott remarked to his friend John Betjeman, “I always think that my father was a genius. … He was a far better architect than my grandfather and yet look at the reputations of the two men”. As a boy Gilbert and his brother Adrian were taken by their mother Ellen on many cycle trips, which he called ‘church crawls’ visiting some of the masterpieces of church architecture on the Kent-Sussex border. 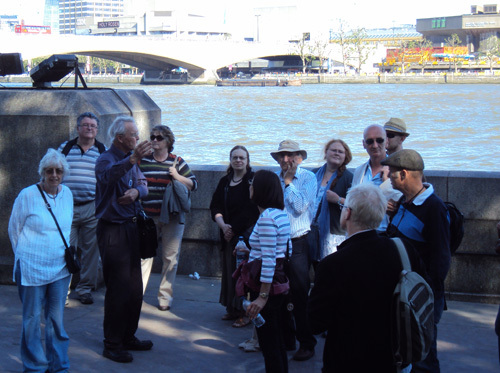 It is possibly these field trips that inspired the young Scott to become one of Britain’s greatest modern church architects. In 1903, when still only 22, he won a competition to design Liverpool’s Anglican Cathedral. However, due to the sheer size of the building, which took over 60 years to complete, and which became his lifelong project, he died before the building was completed. While working in Liverpool, Scott met and married Louise Hughes, a receptionist at the Adelphi Hotel. The marriage was a happy one and lasted until Louise Scott’s death in 1949. They had three sons, one of whom sadly died in infancy. As Liverpool Cathedral arose Scott’s fame grew, and he began to secure commissions for secular buildings. One of the first was for Clare College, Cambridge, Memorial Court, which was in a neo-Georgian style. The style was also used for a house he designed for himself in Clarendon Place, Paddington in 1924. This won the annual medal for London street architecture of the Royal Institute of British Architects in 1928. An English Heritage Blue Plaque commemorates his residence here from 1926 until his death in 1960. He went on to design huge buildings across the UK. Amongst them was Battersea Power Station, which was completed in 1933. 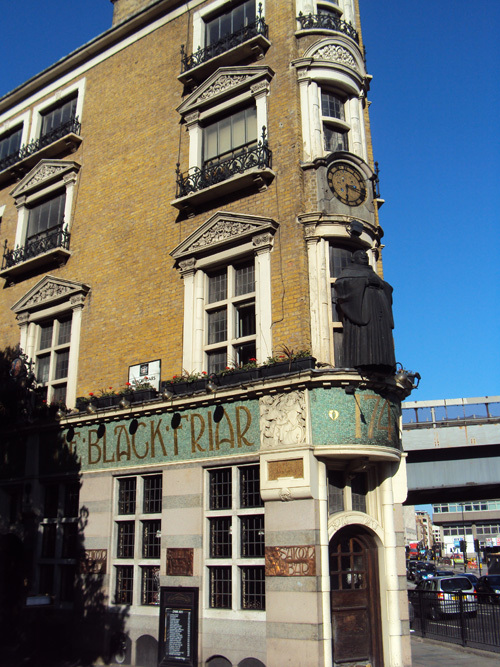 It became one of the most admired as well as conspicuous modern buildings in London. After many years of neglect, it is currently being refurbished as the centre piece of a new development at Nine Elms. 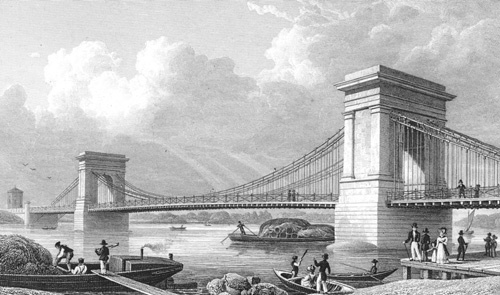 Scott also designed London’s new Waterloo Bridge although at the time there was a lot of controversy over the demolition of John Rennie’s Greek Doric Bridge. It is often referred to as the women’s bridge due to the fact that many of the builders were women during the Second World War, although this was never officially acknowledged. The bridge was formally opened in 1945. After the Commons chamber of the Palace of Westminster was destroyed by bombs in 1941, Scott was appointed in 1944 to rebuild a new chamber. 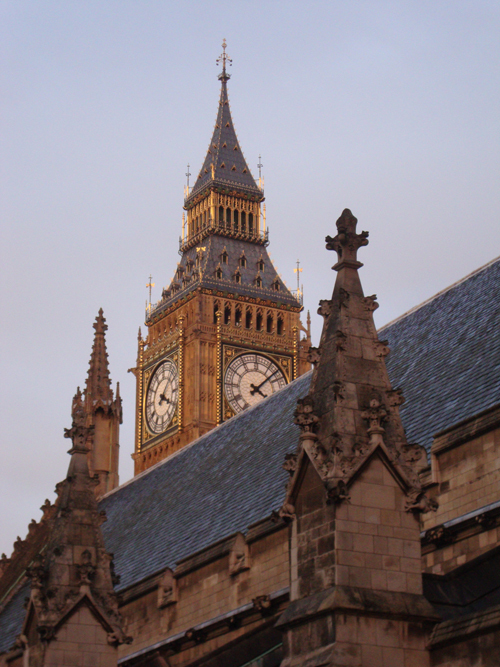 He felt that it should be congruent with the old as anything else would have clashed with the Gothic style of Charles Barry and Augustus Pugin. 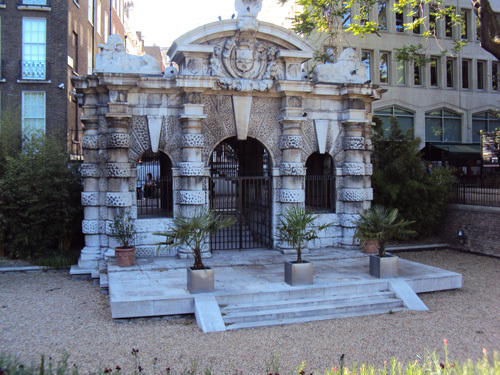 Inspired by the mausoleum that the Neo-Classical Architect, Sir John Soane had designed for himself in St Pancras Old Church Yard, Scott designed two versions of the telephone box for the General Post Office. These iconic pieces of design, of which there are still some 9,500 around the country, are now being put to other uses thereby giving them a new lease of life. The design of the red telephone box and his work on Liverpool Cathedral, led to him receiving a knighthood in 1924. Phone box sculpture, Kingston upon Thames. Possibly his greatest impact on the City of London was Bankside Power Station on the south bank of the Thames opposite St. Paul’s Cathedral. In designing this building, Scott demonstrated that power stations could be fine buildings in their own right. Completed in 1960, the building had a relatively short life as a Power Station closing in 1981 and is now the Tate Gallery of Modern Art. 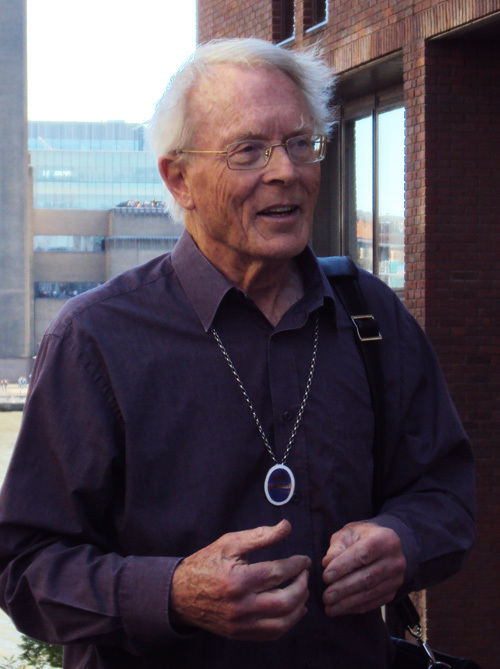 Scott remained working into his late 70s. He was working on designs for the Roman Catholic Church of Christ the King, Plymouth, when he developed lung cancer. He took the designs into University College Hospital, where he continued to revise them until his death aged 79 on 8 February 1960. Scott was buried outside the west entrance of his masterpiece, Liverpool Cathedral, alongside his wife. Unless otherwise stated, all images: London Historians. 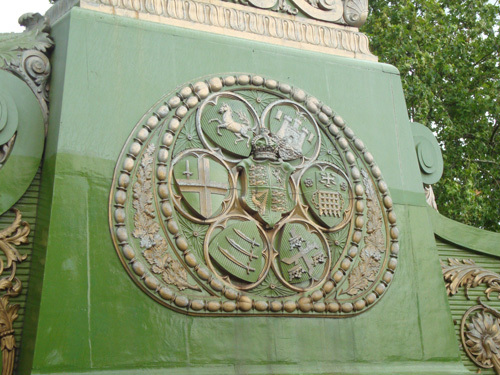 On this day in 1887, Prince Albert Victor – accompanied by his father, the Prince of Wales, later Edward VII – opened the present Hammersmith Bridge. 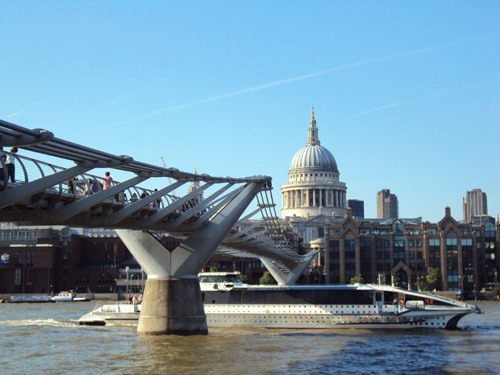 London’s bridges had quite recently been taken into public ownership and made toll-free, to great public acclaim. 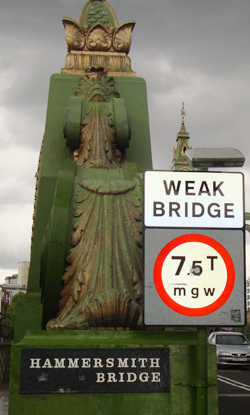 It then became the job of the chief engineer of the Metropolitan Board of Works, Sir Joseph Bazalgette, to inspect the state of all the bridges and return them to a safe and serviceable condition. Bazalgette and his team found the state of the bridges to be generally woeful. 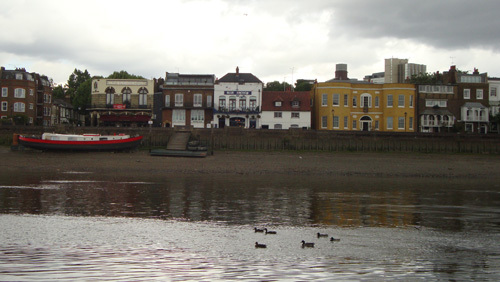 Three of them – Putney, Battersea and Hammersmith – were considered not worth saving. They were demolished and replaced by structures of Sir Joseph’s own design. 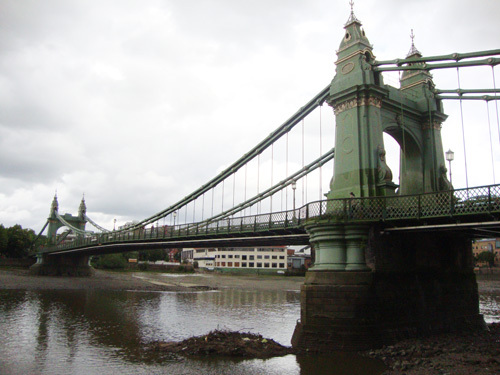 The original Hammersmith bridge was opened in 1827. Designed by William Tierney Clark, it was the Thames’ first suspension bridge, built when that technology was very much in its infancy. Although widely admired by engineers and the public alike, it was never a particular success practically, being far too narrow for the traffic it came to service in the ensuing decades. At its two towers the width of the roadway was a mere 14 feet – insufficient for new modes of transport such as the horse-drawn omnibuses to travel in both directions without putting the lives of pedestrians in peril. But the structure remained sound. All this changed in 1882 when a boat collided with the bridge and a policemen fell through a walkway on his way to investigate. An Act of Parliament was passed in 1883 to build a new bridge. 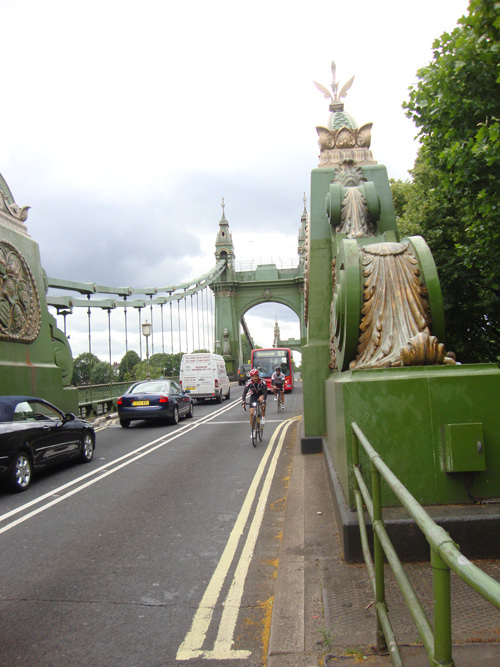 Bazalgette opted to stick to a suspension bridge design. The chief differences between his bridge and Clark’s were that the bridge was wider – 21 feet going through the towers – and it was by comparison highly decorated with much ornamental cast iron. The result was a beautiful structure aesthetically, considered by many to be London’s prettiest bridge, although a notable exception was the interior designer and local resident William Morris. But even the far-sighted Bazalgette did not realise the needs of vehicles in the age of the combustion engine. Today, the old lady is too weak to cope with lorries. There are six feet width restrictors on the approach roads in both directions, although small buses are permitted to bypass these. Further indignities were perpetrated by the IRA who have attempted to blow up the bridge on three occasions, most recently in 2000, causing it to be closed for many months. There have been calls recently from some quarters (eg the art critic Brian Sewell) to replace the bridge with something more modern and sturdy. But most locals love their bridge and will not hear of such at thing. I have to say I agree with them. 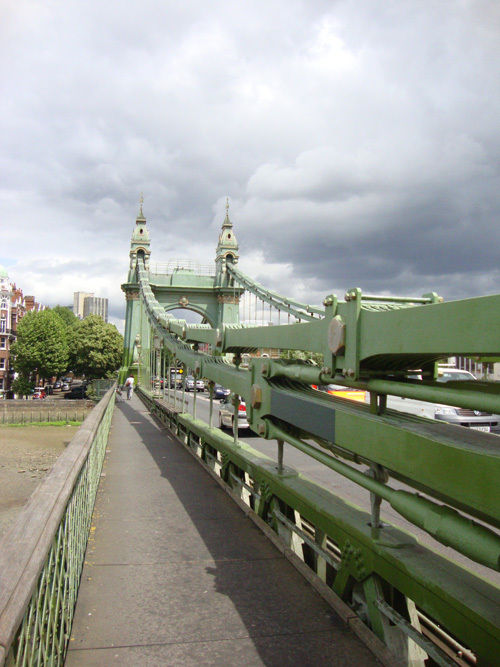 Hammersmith Bridge was not the only bridge we celebrate today. 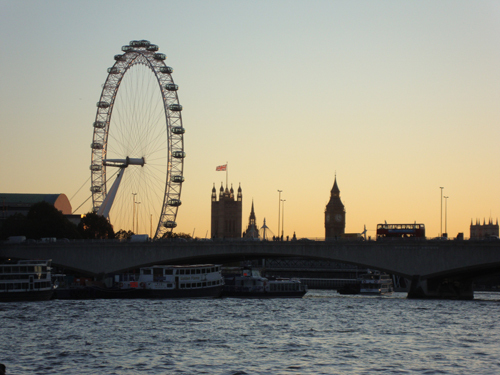 Although now a distant memory, the first Waterloo Bridge – designed by John Rennie – was opened on 18 June 1817 by the Prince Regent and The Duke of Wellington, and named Waterloo for obvious reasons. Wikipedia, as per (they have the opening date wrong). If you’re lucky enough to have a break in the cloud at sunset on an Autumn afternoon, you get gorgeous light for photographs. I was lucky yesterday, and the day before.